The CLA 45 AMG is a car that has intrigued me for a while; truth be told, the CLA-Class has intrigued me since its release in 2013. A Mercedes that started under 30k did sound appealing, especially given the fact that I ended up really liking the B-Class I had a rental in Germany. 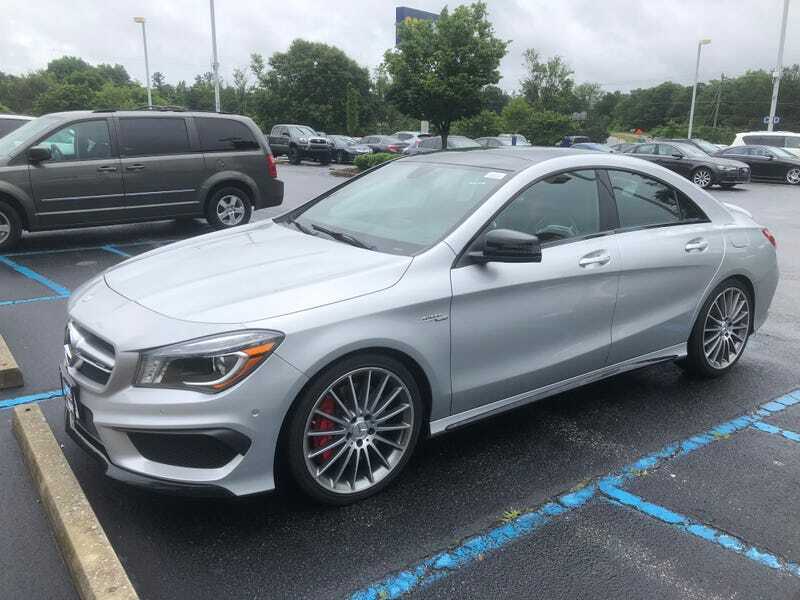 I was eating lunch at my computer seeing what the Carmax near me had, when I saw they had a CLA45. I immediately scheduled a test drive. First impression, it is a hansom car, especially with those wheels. The low roofline helps appearance; however this does cause you to sacrifice rear head room. I sat in the rear seats and my head was touching the head liner and I’m 5'9". There wasn’t a space issue in the front, but I wouldn’t want to spend a long time cramped in the back. The back seat in my 328i is more useful, and it’s an actual coupe. Wouldn’t be bad for kids, but not for adults. I then popped the hood to see what tiny engine AMG had managed to get 355hp and 332 ft/lbs of torque from. Pretty impressive numbers, and according to the internet, it should propel the CLA45 AMG from 0 to 60 in the same time as my E90 M3. The test drive confirmed that this little engine is indeed potent. I’m more used to my naturally aspirated cars and this was a change. Like most turbo engines I’ve come into contact with, it had a mountain of torque low down but ran out of steam at the top end. That said, the CLA 45 is very quick. I found myself looking down and realizing how fast I was going. There really isn’t any complaints about power, I mean you can almost always use more, to a certain point. I just left the transmission in drive and didn’t use the paddles. No complaints here, felt like a normal automatic. Shifts weren’t too brutal or intrusive. Given more time, I probably would have played around with the paddles and seen how the box reacted to manual inputs. I was neither impressed nor displeased with the steering. By no means was it bad, but neither was it electrifying. The first time I drove a 911 I got why people raved about the steering, it is simply fantastic; the weight and feed back is spot on. I didn’t hate the steering, but neither did I love it. What I think I’m trying to convey is that it didn’t really add anything to the driving experience, but then again it didn’t take anything away. I did take an offramp at a faster than recommended speed and it handled it no problem. The CLA45 has four wheel drive and I couldn’t really tell apart from the fact that it takes off very well from a stand still even in the rain. I didn’t get to really chuck it into any corners, but at no point did it feel like it wanted to understeer. So I guess the real question is, would I buy one? There have been some cars I have become enthralled with after a short test drive; 911 turbo, 997 Carrera S, C63 AMG, E92 M3. This was not one of them. It was a nice driving car that I like the styling of, but I just don’t want one. If I wanted a small fast Mercedes from Carmax, I would spend my 35k on this C63 instead.